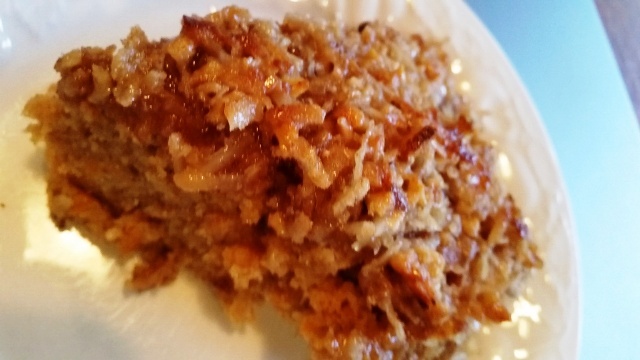 Sweet Potato Skillet Cake with Broiled Coconut and Pecan Icing and a Cookbook Giveaway! 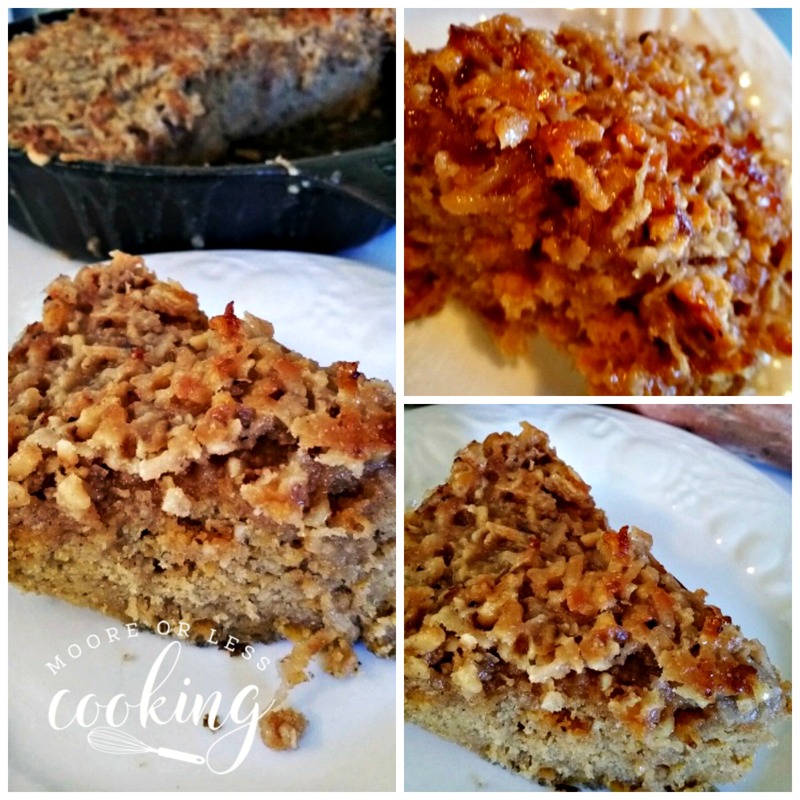 Sweet Potato Skillet Cake with Broiled Coconut and Pecan Icing, is a moist, flavorful and delectable cake with a crunchy pecan and coconut icing. I just love sweet potatoes. I eat them all year round! I am so excited to review Jackie Garvin’s amazing Sweet Potato Cookbook. I tested three recipes and fell in love with all them! 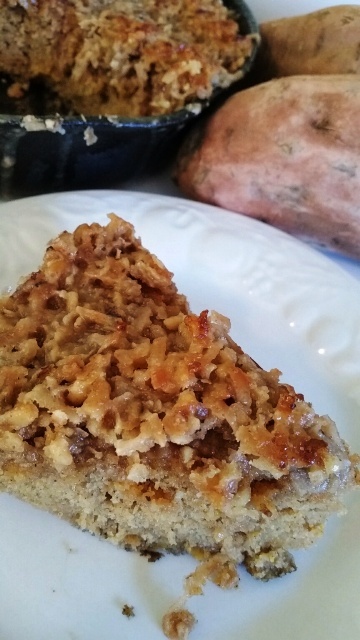 I had to share this incredible Sweet Potato Skillet Cake with Broiled Coconut and Pecan Icing, it is the BOMB!! 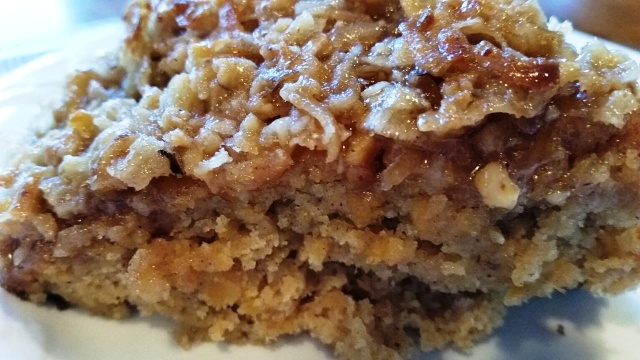 Moist, delectable cake with a crunchy pecan and coconut icing. It is a wonderful cake for any occasion!! Mash sweet potato in a separate bowl. 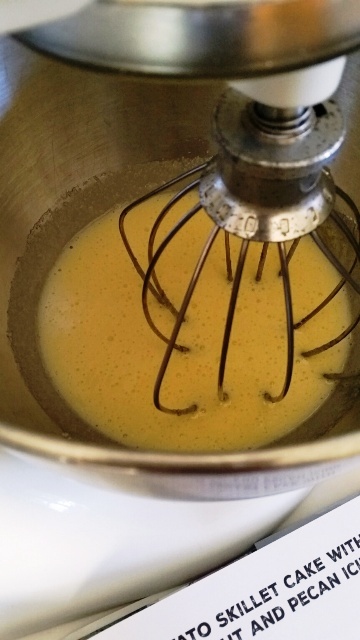 In the same bowl of the Kitchen Aid, add buttermilk, baking soda, melted butter, and mashed sweet potato. Stir until mixed. Add flour, cinnamon, and ginger to a small bowl and stir lightly. 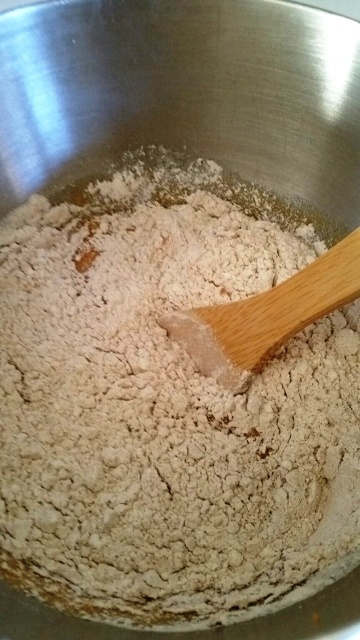 Add flour mixture to wet ingredients and stir with a wooden spoon until mixed. Pour into a well-seasoned 9-inch cast iron pan. You can also use a greased and floured 8-inch square pan if you like. Bake at 350 degrees for 30 minutes or until a toothpick inserted in the center comes out clean. Remove from oven and prepare the icing. Cook butter, brown sugar, buttermilk, and salt in a small pan over medium heat, continue stirring until the butter and sugar have melted. 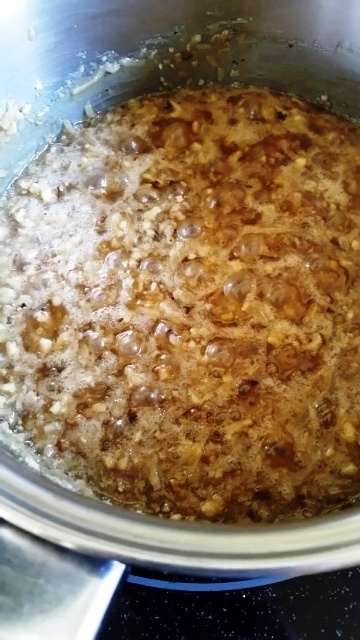 Add coconut and pecans and continue stirring until the mixture reaches a medium rolling boil. Immediately, pour icing on top of warm skillet cake and spread across the entire surface. 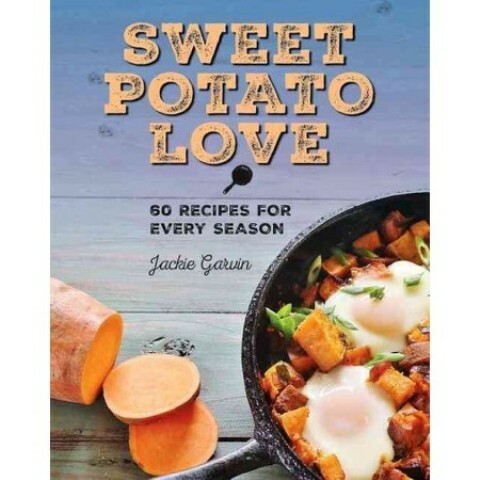 Sweet Potato Love~60 Recipes for Every Season, by Jackie Garvin Giveaway: one copy of The Cookbook, Sweet Potato Love, author: Jackie Garvin. This wonderful cake falls under the category of the season of spring, but it is not limited to this season and is also delicious in the winter, as a Christmas cake. As I leafed through the cookbook pages, I also dog-eared the recipes that I am making now, and will be making in the near future. In one weekend, I made the Lentil, Sweet Potato, and Chipotle Pepper Chili, which is simply outstanding, along with the chili, I imagined that the Sweet Potato Cornbread ( with bacon) would make the best side dish. I was not disappointed in the savory flavors and my family was thrilled, as were our house guests. They are requesting the recipes! This wonderful cookbook contains beautiful photography and fantastic antidotes for each recipe, making me yearn to bake and cook each recipe and loading up on pounds of sweet potatoes!! Giveaway: one copy of The Cookbook, Sweet Potato Love, author: Jackie Garvin. 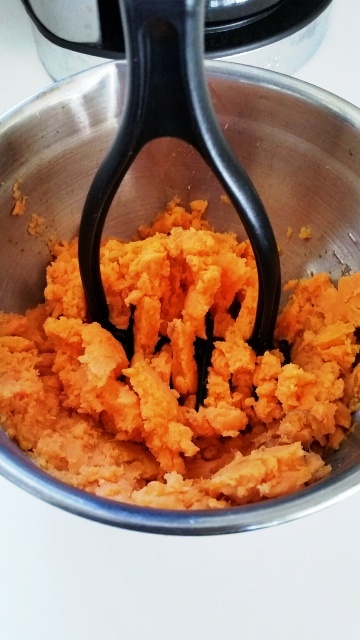 Comment below: What is your favorite sweet potato recipe? Contest ends January 13th, 2016 at 12:00 am EST. 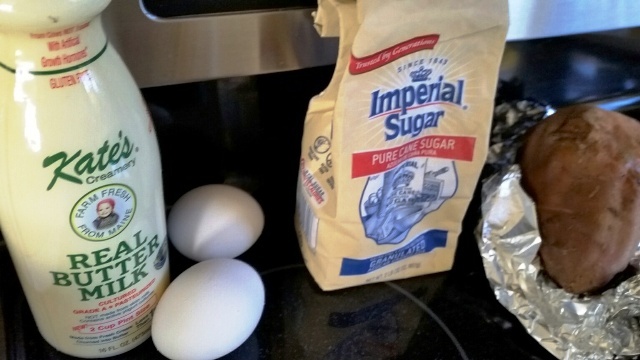 Beat together eggs and sugar until creamy and pale yellow. 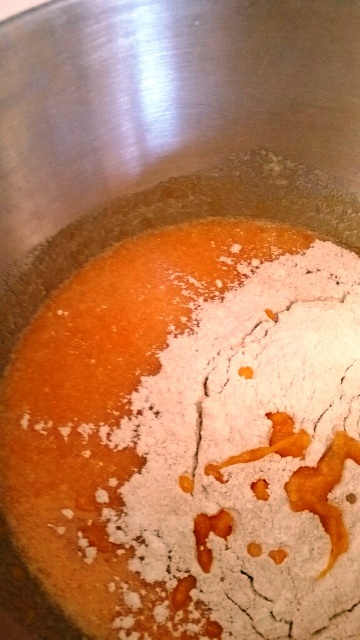 In the same bowl, add buttermilk, baking soda, melted butter, and mashed sweet potato. Stir until mixed. Add flour, cinnamon, and ginger to a small bowl and stir lightly. 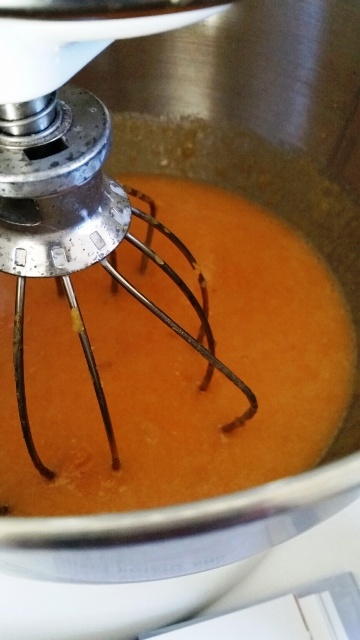 Add flour mixture to wet ingredients and stir with a wooden spoon until mixed. 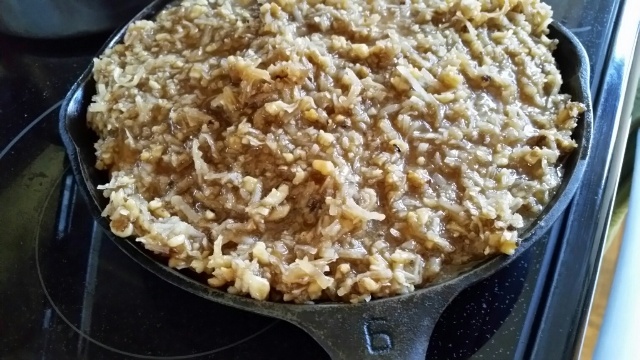 Pour into a well-seasoned 9-inch cast iron pan. You can use a greased and floured 8-inch square pan instead. Remove from oven and prepare icing. Cook butter, brown sugar, buttermilk, and salt in a small pan over medium heat, stirring constantly, until the butter and sugar have melted. Add coconut and pecans and continue stirring until the mixture reaches a medium rolling boil. 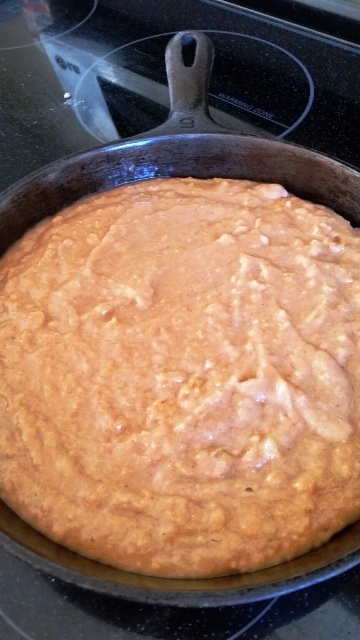 Immediately, pour icing on top of warm skillet cake and spread across entire surface. Place under broiler for 2 to 3 minutes or until browned. Do no get distracted. Once the topping starts to brown, you've got a few seconds that separates browned from burned. Remove from oven and completely cool on a cooling rack before cutting. To be honest I have only ever had them with brown sugar and marshmallow as a side dish at Thanksgiving. This cookbook would be a good way to try out new ways to use them. 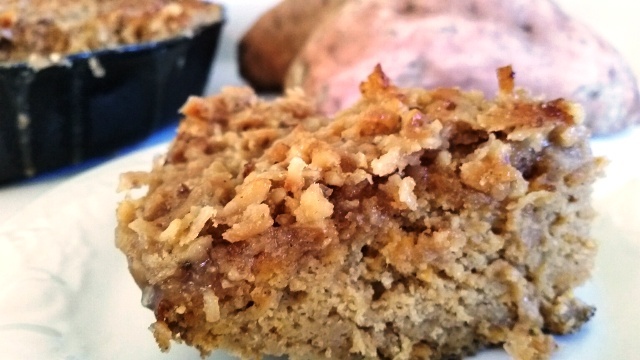 I love sweet potatoes no matter how they are prepared…in casseroles, biscuits, cornbread, muffins, cakes, or pies. They are so versatile and can be both savory or sweet. 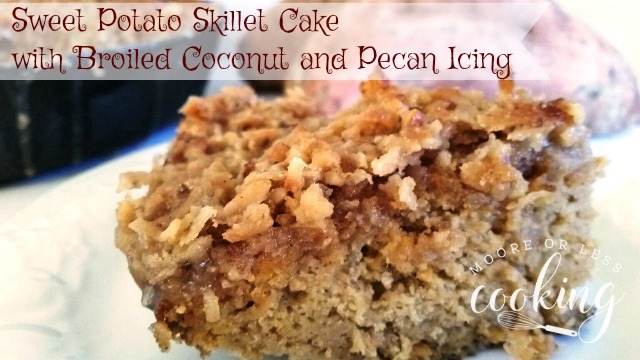 This cake with broiled coconut and pecan icing sounds divine! Can’t wait to make it. yummy! these recipes are great! my fav are sweet potato fries…. I like to make pulled pork on top of a sweet potato, sweet potato fries, & sweet potato casserole. 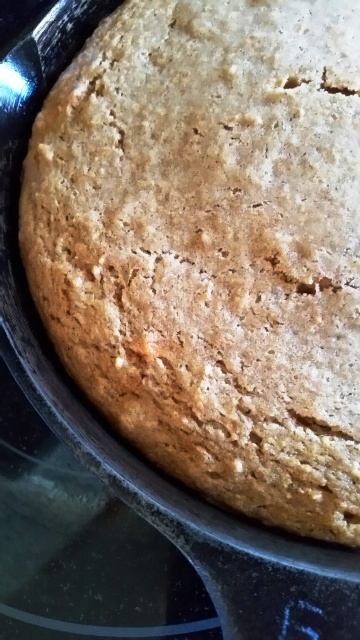 This sweet potato skillet cake will now become my favorite if I can convince my daughter to make it for me. We both really enjoy your recipes and blog. Thank you for sharing and giving away a treasured cookbook. I want to try this recipe, yum! I don’t cook a lot with sweet potatoes but this recipe looks fantastic! I love sweet potato casserole and baked sweet potatoes with butter!! looks yummy, can’t wait to try it. This is a bit like asking me which beagle is my favorite, but I do adore sweet potato biscuits. I was so happy to see that sweet potatoes are allowed on my new diet, because it would have been very sad if they hadn’t been. I do adore my sweet potatoes! Looking forward to making the Sweet Potato Skillet Cake soon for my husband! One of my favorite recipes is a Sweet Potato Jalapeño soup. Different, but so good!! I love sweet potatoe muffins! The pie recipe looks yummy!! them. Would like a new cook book to try out. This cake looks heavenly! I like to bake a sweet potato in the oven while something is cooking, I don’t add anything to it. I also love making sweet potato fries. I love sweet potatoes & this cake looks so delicious & easy to make. Thank you. Would love to have your book & make all these amazing things. my aunt’s Sunday Sweet Potatoes! A must for holidays! A sweet potato purée with sugar, vanilla and cream mixed in.. then topped with a coconut, brown sugar, pecan mixture… sooo stinking yummy!!! My great grandmother’s recipe: just baked sweet potatoes, sugar, vanilla, milk, and eggs. This sweet potato recipe looks delicious.. Of course, I live in Australia, so shipping, if I won, would be by sea. I can definitely wait till it arrives.. I will be making this cake.. In my cast iron skillet, too. As for my favorite sweet potato recipe. 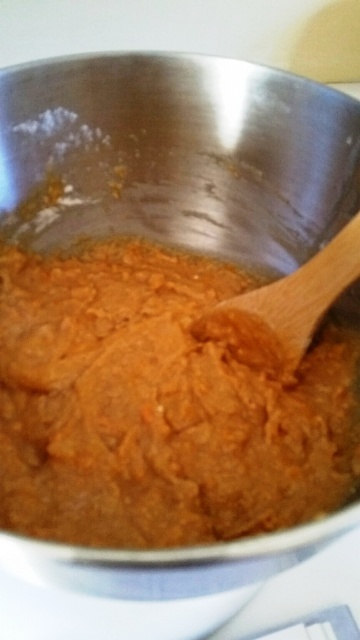 I make a pumpkin mixture that I change for sweet potato quite often.. I cut sweet potato in cubes, along with apple (red or green – large apple), celery 3 stalks , red onion chopped (roughly), and crasins.. I mix in a 13 x 9 dish with oil. (not a lot).. Bake in my oven, 380 degrees F or 180C, for about 35 mintues.. About 10 min before taking out, I add some macadamia nuts.. My family love it with the Sweet Potato, especially my son that doesn’t like pumpkin.. Me!!! I would love to win your cookbook, filled with all of your delicious recipes!!!! Would it be okay for my grand niece to make this for our county fair. She would reference you in the recipe card. This cake is Fabulous!!! Which kind of sweet potatoes? Pre-baked fresh or canned and drained? For this cake, fresh sweet potatoes baked until soft.